CrossFit is an amazing fitness regiment that not only encompasses full range of motion and functional movements, but also a sense of community and recreational activity. Trying CrossFit for the first time shouldn’t be intimidating, we encourage our new clients to come to our clean and friendly environment and and try it in an inviting atmosphere that is welcoming and informative. We know how intimidating it can be to watch CrossFit on ESPN… that’s not what we are going to ask you to do. At CrossFit West Cobb you can come in ten minutes before the start time of any of our classes and try a workout for FREE. During this class your instructor will explain the layout of a typical class, put you through your warm-up, teach you the movements you will be using for the workout, and coach you through your first WOD (Workout of the Day). It is important to know that CrossFit is made for ALL ages, and ALL fitness levels. Our trainers are specialized in these movements and are committed to not only your progression in fitness, but also your safety. Every workout that you do will be catered to your individual ability and fitness level. No program is complete with out a solid foundation. The foundation of our program at CrossFit West Cobb is food. We are firm believers that without focusing on nutrition, it is impossible to reach any of your health/fitness goals. We also do not believe that you should have to pay extra to receive coaching on the subject. With your membership you will receive nutrition coaching as often as if it needed to help you be successful. We will teach you the science behind what we teach to help you understand why you will be making the dietary changes that we will recommend as well help you learn the necessary skills such as planning, recipes, and food prep so that you can continue your healthy habits for the rest of your life. We do need teach or encourage short-term diets that are not sustainable. We teach you and your family how to eat REAL food that will have amazing affects on how you feel and function throughout the day as well as substantial, lasting affects on fat loss and muscle building. 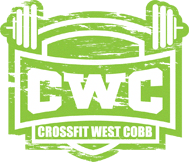 CrossFit West Cobb has recently built an amazing yoga studio on site that allows for a wonderful experience. Whether you are just getting started or have been practicing for years, our instructors are incredibly helpful, patient, and encouraging. Yoga pairs extremely well with Crossfit which is why it is included in our general membership but we also offer Yoga only memberships and punch-cards if needed. We offer a free class before making any decisions about signing up so come by and try it out! If you are looking for a more personalized program with a bit more specific attention we offer personal training. Sessions can be tailored to your needs and can be 30,45,60, or 75 minutes long with the instructor of your choice. Call for pricing and scheduling to get started.